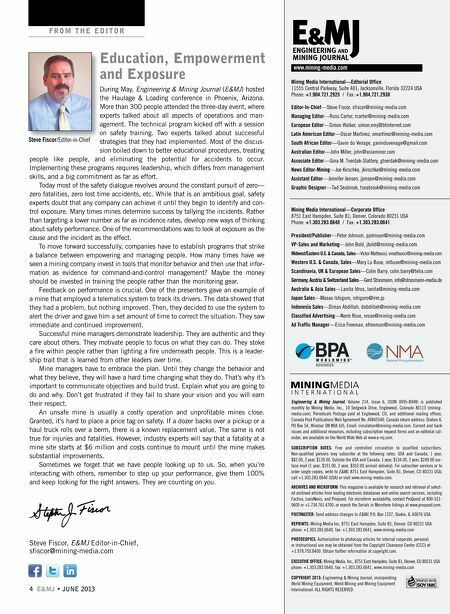 FROM THE EDITOR Education, Empowerment and Exposure During May, Engineering & Mining Journal (E&MJ) hosted the Haulage & Loading conference in Phoenix, Arizona. More than 300 people attended the three-day event, where experts talked about all aspects of operations and management. The technical program kicked off with a session on safety training. Two experts talked about successful Steve Fiscor/Editor-in-Chief strategies that they had implemented. Most of the discussion boiled down to better educational procedures, treating people like people, and eliminating the potential for accidents to occur. Implementing these programs requires leadership, which differs from management skills, and a big commitment as far as effort. Today most of the safety dialogue revolves around the constant pursuit of zero— zero fatalities, zero lost time accidents, etc. While that is an ambitious goal, safety experts doubt that any company can achieve it until they begin to identify and control exposure. Many times mines determine success by tallying the incidents. Rather than targeting a lower number as far as incidence rates, develop new ways of thinking about safety performance. One of the recommendations was to look at exposure as the cause and the incident as the effect. To move forward successfully, companies have to establish programs that strike a balance between empowering and managing people. How many times have we seen a mining company invest in tools that monitor behavior and then use that information as evidence for command-and-control management? Maybe the money should be invested in training the people rather than the monitoring gear. Feedback on performance is crucial. One of the presenters gave an example of a mine that employed a telematics system to track its drivers. The data showed that they had a problem, but nothing improved. Then, they decided to use the system to alert the driver and gave him a set amount of time to correct the situation. They saw immediate and continued improvement. Successful mine managers demonstrate leadership. They are authentic and they care about others. They motivate people to focus on what they can do. They stoke a fire within people rather than lighting a fire underneath people. This is a leadership trait that is learned from other leaders over time. Mine managers have to embrace the plan. Until they change the behavior and what they believe, they will have a hard time changing what they do. That's why it's important to communicate objectives and build trust. Explain what you are going to do and why. Don't get frustrated if they fail to share your vision and you will earn their respect. An unsafe mine is usually a costly operation and unprofitable mines close. Granted, it's hard to place a price tag on safety. If a dozer backs over a pickup or a haul truck rolls over a berm, there is a known replacement value. The same is not true for injuries and fatalities. However, industry experts will say that a fatality at a mine site starts at $6 million and costs continue to mount until the mine makes substantial improvements. Sometimes we forget that we have people looking up to us. So, when you're interacting with others, remember to step up your performance, give them 100% and keep looking for the right answers. They are counting on you. ENGINEERING AND MINING JOURNAL www.mining-media.com Mining Media International—Editorial Office 11555 Central Parkway, Suite 401; Jacksonville, Florida 32224 USA Phone: +1.904.721.2925 / Fax: +1.904.721.2930 Editor-In-Chief—Steve Fiscor, sfiscor@mining-media.com Managing Editor—Russ Carter, rcarter@mining-media.com European Editor—Simon Walker, simon.emj@btinternet.com Latin American Editor—Oscar Martinez, omartinez@mining-media.com South African Editor—Gavin du Venage, gavinduvenage@gmail.com Australian Editor—John Miller, john@asiaminer.com Associate Editor—Gina M. Tverdak-Slattery, gtverdak@mining-media.com News Editor-Mining—Joe Kirschke, jkirschke@mining-media.com Assistant Editor—Jennifer Jensen, jjensen@mining-media.com Graphic Designer—Tad Seabrook, tseabrook@mining-media.com Mining Media International—Corporate Office 8751 East Hampden, Suite B1; Denver, Colorado 80231 USA Phone: +1.303.283.0640 / Fax: +1.303.283.0641 President/Publisher—Peter Johnson, pjohnson@mining-media.com VP-Sales and Marketing—John Bold, jbold@mining-media.com Midwest/Eastern U.S. & Canada, Sales—Victor Matteucci, vmatteucci@mining-media.com Western U.S. & Canada, Sales—Mary Lu Buse, mlbuse@mining-media.com Scandinavia, UK & European Sales—Colm Barry, colm.barry@telia.com Germany, Austria & Switzerland Sales—Gerd Strasmann, info@strasmann-media.de Australia & Asia Sales—Lanita Idrus, lanita@mining-media.com Japan Sales—Masao Ishiguro, ishiguro@irm.jp Indonesia Sales—Dimas Abdillah, dabdillah@mining-media.com Classified Advertising—Norm Rose, nrose@mining-media.com Ad Traffic Manager—Erica Freeman, efreeman@mining-media.com Engineering & Mining Journal, Volume 214, Issue 6, (ISSN 0095-8948) is published monthly by Mining Media, Inc., 10 Sedgwick Drive, Englewood, Colorado 80113 (miningmedia.com). Periodicals Postage paid at Englewood, CO, and additional mailing offices. Canada Post Publications Mail Agreement No. 40845540. Canada return address: Station A, PO Box 54, Windsor ON N9A 6J5, Email: circulation@mining-media.com. Current and back issues and additional resources, including subscription request forms and an editorial calendar, are available on the World Wide Web at www.e-mj.com. SUBSCRIPTION RATES: Free and controlled circulation to qualified subscribers. Non-qualified persons may subscribe at the following rates: USA and Canada, 1 year, $82.00, 2 year, $139.00. Outside the USA and Canada, 1 year, $134.00, 2 year, $249.00 surface mail (1 year, $191.00, 2 year, $352.00 airmail delivery). 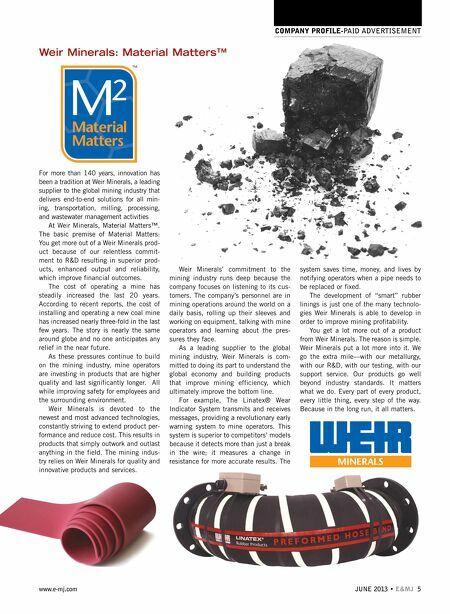 For subscriber services or to order single copies, write to E&MJ, 8751 East Hampden, Suite B1, Denver, CO 80231 USA; call +1.303.283.0640 (USA) or visit www.mining-media.com. ARCHIVES AND MICROFORM: This magazine is available for research and retrieval of selected archived articles from leading electronic databases and online search services, including Factiva, LexisNexis, and Proquest. For microform availability, contact ProQuest at 800-5210600 or +1.734.761.4700, or search the Serials in Microform listings at www.proquest.com. POSTMASTER: Send address changes to E&MJ, P.O. Box 1337, Skokie, IL 60076 USA. REPRINTS: Mining Media Inc, 8751 East Hampden, Suite B1, Denver, CO 80231 USA phone: +1.303.283.0640, fax: +1.303.283.0641, www.mining-media.com Steve Fiscor, E&MJ Editor-in-Chief, sfiscor@mining-media.com PHOTOCOPIES: Authorization to photocopy articles for internal corporate, personal, or instructional use may be obtained from the Copyright Clearance Center (CCC) at +1.978.750.8400. Obtain further information at copyright.com. EXECUTIVE OFFICE: Mining Media, Inc., 8751 East Hampden, Suite B1, Denver, CO 80231 USA phone: +1.303.283.0640, fax: +1.303.283.0641, www.mining-media.com 4 E&MJ • JUNE 2013 COPYRIGHT 2013: Engineering & Mining Journal, incorporating World Mining Equipment, World Mining and Mining Equipment International. ALL RIGHTS RESERVED.